Self-draining showers can be used in any environment. They are ideal for use outdoors especially in hot climates as they drain down and do not hold water in the pipework. Manufactured with corrosion resistant materials and available with or without a heavy duty outer jacket (GRP) to protect shower pipework. All units fitted with stainless steel operating valves for a long and trouble-free life. Designed to be highly visible. Suitable for temperatures from -10 deg C to + 60 deg C. For temperatures below -10 deg C, the additional frost protection kit can be added to protect the operational valves. The showers can be fitted with stainless open eyebath or heavy duty GRP eyebath with lid. 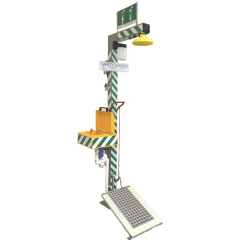 Other optional extras available to suit any site requirement. Aqua Safety Showers International Ltd is a world-leading and independently owned UK manufacturer of emergency safety showers and eyebaths. Established in 2016 by a team of people drawn from engineering, management & sales backgrounds with over 40 years’ experience in the safety shower industry; each one having a common passion of creating an independent competitive company to provide standard and customised safety showers for the oil, gas, water and chemical industry.